For over 30 years the Canada-France-Hawaii Telescope and its international community have developed innovative capabilities to support advanced research. 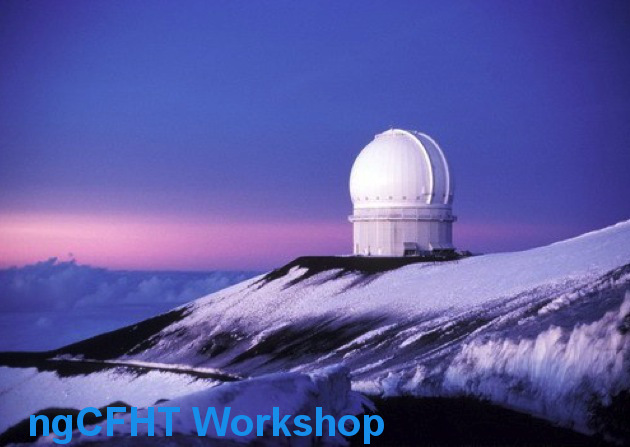 CFHT was among the first on Mauna Kea to develop a facility class adaptive optics system, multi-object and integral field spectrographs, and wide field panoramic imagers. Today we look to a future that builds upon our past, including the possibility of replacing the current 3.6 m telescope with a 10 m facility dedicated to wide field spectroscopy. If pursued, the next-generation CFHT (ngCFHT) would re-use the existing facility except for the telescope and dome, which would be replaced. While this concept is in infancy from a technical development perspective, considerable work has been completed in defining the science objectives for such a facility and we look forward to hosting members of the international astronomy community in Hawaii to discuss ngCFHT.